Friday night my boyfriend surprised me in Clemson - I was in town for the game and he was supposed to be in Charlotte at the lake with some of our other friends. 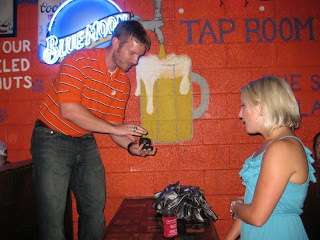 My close girlfriends and I had gotten to Clemson, freshened up, and headed to the Sloan St. Tap Room - which is a dive bar I worked at for 2.5 years while in grad school. Little did I know that my boyfriend had gotten all of our friends together, his family and my family across the street at Tiger Town Tavern. My girlfriends and I got to the Tap Room and were hanging out when all of a sudden a bunch of our friends walked in - well we were expecting to meet up with them anyways, so I wasn't really surprised to see them...just surprised they were ALL together, lol. They came in doing the Clemson cheer - so being the big Clemson fan I am, of course I joined them. Then I see my boyfriend's brother walk in....and then his sister and her family...then my sister, holding a video camera...and then my parents (my family was supposed to be at the beach in NC). I start to realize that something is going on and I just feel tears streaming down my face because I know... at that moment I just knew. Then out of nowhere my boyfriend comes running in and jumps up on the table - he gives a short and sweet speech and then leans down to me and proposes. And of course I say YES!! You can watch the whole thing - courtesy of my sister - in the video below. It's hilarious because you see me doing the Clemson cheer and then I get really confused...then I throw my purse and beer down, because at that point... I know something is up! And cameras do really add about 10 pounds - geez...guess I'll need to start that wedding diet now! So a lot of people probably go "huh?" when they hear that my boyfriend proposed to me in a bar... but it's not really just any bar, it's like my Clemson home. I spent so much time working there in grad school and made some lifelong friends with the locals who still to this day call me to check in on me or feed me at their tailgates. If I'm in Clemson for anything, I always stop by. So my boyfriend knew it would be a perfect place for me - because I love Clemson and I love that bar, lol. Then on Saturday, my parents arranged for us to meet up with Clemson's head coach, Dabo's parents (they go to church with my parents in B'ham) before the football game. We got to go behind the scenes in the West End Zone and saw Dabo's office, met and hung out with his wife Kathleen and met and took a photo with Dabo. After Clemson we headed straight to Holden Beach, NC to meet up with my family for a few days at the beach and got home last night at midnight. So as you can imagine, blogging hasn't been on the top of my To Do list recently. Tomorrow night is our four year anniversary - so we'll be celebrating with dinner and a movie. Oh my gosh, that is no kidding one of the sweetest proposal stories I've ever heard. I love how personal and special it is. Your boy obviously put a lot of thought into it :) Congratulations!! AWWWWWWWWWWWWWWWW Congratulations to both of you!! This is an incredibly touching proposal/story and I'm so glad you shared it with us. Congratulations!!!!! What a great surprise! Congrats! What a neat surprise! Congratulations!!!!!! So glad you got it on video too...that is so special! Congratulations! That is such an awesome video and a very original proposal! oh my goodness -- that video is perfect!! so cute. and your ring is beautiful! congratulations, sweet girl! That's so awesome your sister caught the proposal on video! Your ring is beautiful too!!! OMGGGGG this is the sweetest story ever! First, I LOVE LOVE the way you got engaged in Clemson :) Second, getting to go behind the scenes with Dabo is way tooo freaking cool! CONGRATULATIONS! So excited for you! BTW..love the orange dress! YIPPEEEEEEEE SKIPPPEEEEEEEES HONEY! Congratulations with ALL MY HEART! Couldn't be happier for you, baby girl, and OMG what a gorgie ring, you must be on cloud 9 (++++++)! :) Hugs to you doll, you deserve it all! So sweet! I love the video. Congrats!! CONGRATULATIONS girlfriend! I have been out of the blogging loop for awhile....as in it is very hit and miss! 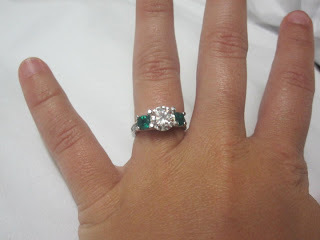 Your ring is GORGEOUS!! Cannot wait to hear about the wedding details! Can I get a woot woot!!! Yeah for you!!! That is so adorable! congrats!! I think it's great that he knew exactly where you would want to get engaged and what the ring would look like. I think it's a sign! Congrats again, have fun with wedding planning!